Having abolished the M4 bus lane some hard-line motorists are now gunning for getting rid of bus lanes and are regretably even getting the support of local papers. A great example of this sort of thing is the campaign to get rid of the bus lane along the A40 into High Wycombe is now being championed by the Bucks Free Press who have created a ‘ban the bus lane’ petition to support their ’cause’. The advocates of removing the bus lane say that it is dangerous and slows motorists – the council patiently explains that removing the bus lane will not increase the number of vehicles able to get into the town and will only result in slower journeys because of bus passengers switching to cars. The bus company point out that the lane is well used by buses and that they are about to increase the level of service with new buses. Here are some maps showing what is going on (all taken from official data). 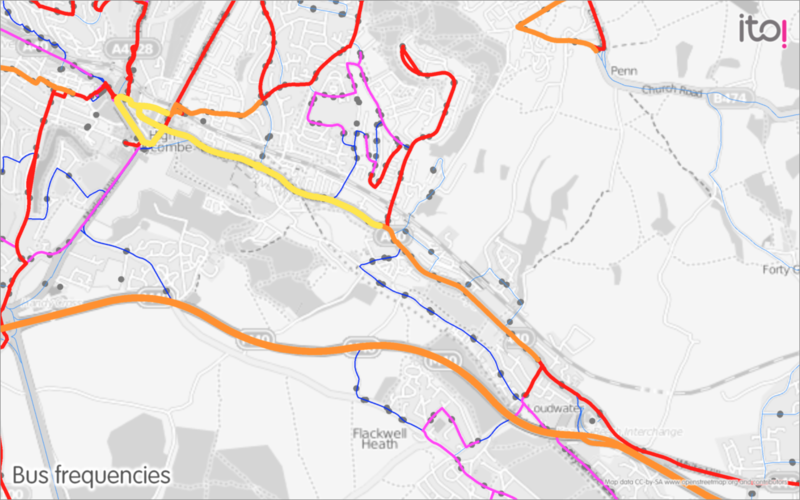 The first one shows bus service frequency on roads in the area (yellow most frequent) and confirms that there are many bus services along the A40 from Loudwater in the bottomm right of the map into High Wycombe at the top left. 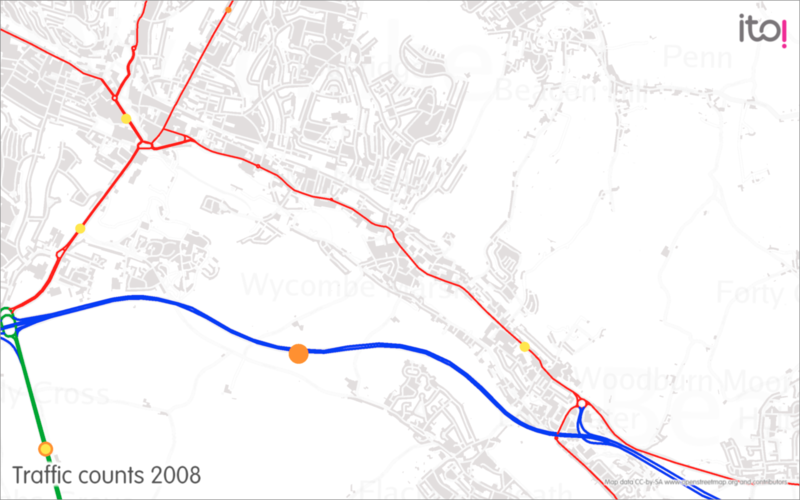 The second one shows traffic counts and traffic mix in the area in 2008 – the small yellow dot on the A40 towards the bottom right indicates that over 85% of the vehicles using that road are private cars or taxis. This confirms that the problem of congestion on the road is from cars not buses! One of the reasons given for removing the bus lane is because ‘it is an accident waiting to happen’. 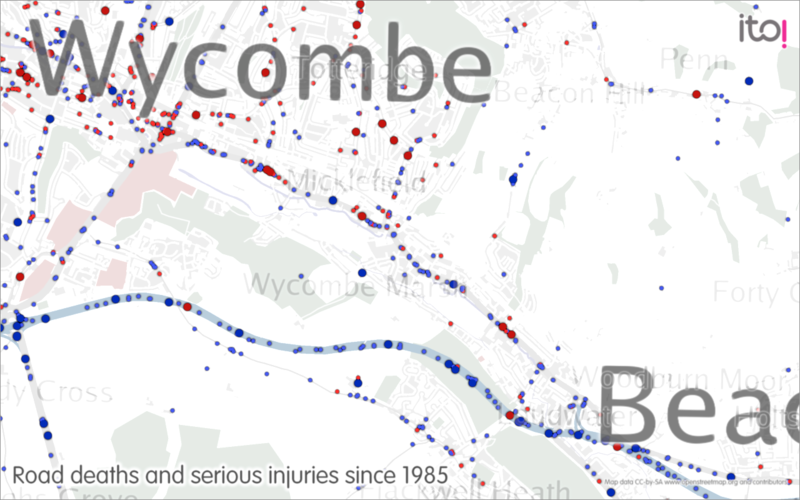 Here are the actually accident results since 1985 on the road (big red dots a pedestrian fatality, small red dot a pedestrian serious injury, big blue dot for a driver fatality and a small blue dot for a driver serious injury). There have regrettably been six of pedestrian fatalities and two driver fatalities and also a number of driver serious injuries (how fast do you have to be traveling in a car in an urban area to have a serious injury I wonder)! Possibly this is a good reason to slower well-enforced speed limits rather than the removal of a bus lane? The final map shows where the schools are and where the kids live. As you can see most of the kids have to cross the A40 road to get to school each day. All maps produced by the pre-release version of ITO Map. Base mapping OpenStreetMap and contributors. All maps cc-by-sa 3.0. I think the same issue here is that against the M4 lane: you are stuck in a car watching buses (and bicycles & taxis) glide past. That creates resentments, and I think it’s one reason of the anti-cycling issues -the fact that no matter how much you spend on a car they go past you in the traffic jam, then get in you way on a clear stretch. Agreed, and I like the association you propose between the frustration motorists must feel at bicycles wizzing past and their frustration at buses doing the same. Personally, I have not give up hope that the private car is dwindling in importance and that the mood is changing. After all, at least we have a load of bus lanes for motorists to be moaning about in the first place and Norman Baker is in no mood to see them go. I know Wycombe quite well. In my experience of several Chiltern towns, the greatest single obstruction to buses is motorists who park in the marked bus – only space at bus stops. The stop by Frogmore where the Aylesbury bus halts is an example. This obliges the bus driver either to pull partway in at a diagonal to the kerb, parallel and in the middle of the road, or away from the stop but at least near the kerb. As most bus stops in towns are near some hazard as defined in the Highway Code, all of these can cause obstruction to traffic, oblige other road users to enter a hazard situation or deprive pedestrains of seeing and being seen. Thus, irresponsible parking causes accidents. The advice often given to all vehicle users is to allow good time for your journey. If one enjoys the benefits (?) of living in a built up area, be prepared to leave earlier to avoid frustration.